Coming from different corners of the world, these youths share a common love for Tet, Vietnam’s Lunar New Year holiday. Meeting Tuoi Tre (Youth) newspaper journalists in a coffee shop in District 2, Nathalie Halbete, a French national living in Ho Chi Minh City, brightened up as she spoke about Tet. Born and raised in Paris, Halbete said her past six years in Vietnam had been the most beautiful time in her life. For a foreigner, Halbete knows a lot about Vietnamese customs and traditions, including the country’s taboos. She said one should avoid visiting others outside of their family on Lunar New Year’s Day, as it could bring bad luck to the hosts. Though speaking little Vietnamese, Halbete said she had never felt it a challenge to live in Vietnam as she had already considered it her second home, where she even has more friends than back in France. She added that Tet is her much-awaited time of the year, when she would blend in with the crowd on Lunar New Year’s Eve to wait for the fireworks. As the city has announced the cancelation of any fireworks show this year, Halbete hopes to see alternative entertainment programs being organized for locals and foreigners to join. For Vilaysak PhanDanouvong, a Lao exchange student at the Diplomatic Academy of Vietnam in Hanoi, the thing about Tet that touches him the most is the tradition of Vietnamese youths who live far away from home to be reunited with their family over a New Year meal. The feeling was shared by Canadian man Austin Carter, co-founder of Vietnam’s first education review community EBIV, who said he had the first taste of Vietnamese Tet in 2016 when he spent the holiday at a friend’s hometown in southern Vietnam’s Vung Tau City. Carter joined his friend’s family to visit their relatives and neighbors to exchange Tet wishes, a tradition observed by many Vietnamese families demonstrating the country’s communal culture. He said he was glad to see many young Vietnamese spending the weeks leading up to Tet to do charity work and help the less fortunate in the country, which he said is also common in his home country. Benjamin James, a music producer from the UK, is brushing up on his Vietnamese to better integrate into the local culture, and he has promised to write a song about the people and life in Ho Chi Minh City when he has enough experience about the city. Last year was James’ first Tet in Vietnam, but he was so new to the country at the time that he knew little to do. He said he was looking forward to this year’s holiday, when he is going to join a friend’s family on a homecoming trip to the Mekong Delta province of Ben Tre and enjoy the Lunar New Year atmosphere in the countryside. James was surprised to see many Vietnamese trying their best to be reunited with their family during Tet or other holidays, as it is rarely seen in his home country. Dressed in a male design of the Vietnamese ‘ao dai’ dress, James said he felt smarter and more gentlemanly each time he put on the national costume of Vietnam. 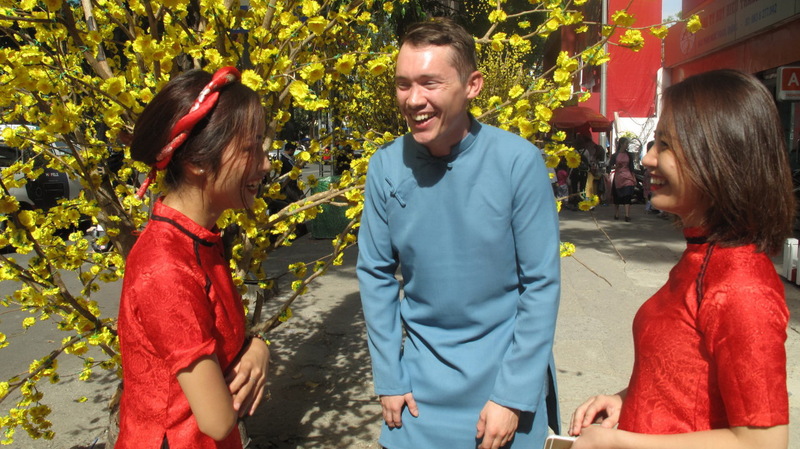 For Erik Perttu, a Swedish IT manager, each of the past three Lunar New Years has been a different experience for him as he had spent it in a different region of the country. Perttu has a Vietnamese girlfriend who was born in Nha Trang City, so he said he had been able to compare how similarly and differently people observe the holiday in Nha Trang and Ho Chi Minh City. Yazan Ayaydeh, a Palestinian exchange student at Hanoi University, said Vietnamese Tet bears many resemblances to the traditional New Year in Palestine, as people also wear new clothes and visit family members on New Year’s Day. The tradition of giving lucky money to children on the first day of the new lunar year is also observed by Palestinians as a way of wishing good luck, health, success and happiness, Ayaydeh said.